The love affair of my uncle and aunt shows us the pitfalls of trying to decipher a relationship. How could I not love an uncle who, when he babysat for me, let me stay up well past my bedtime to watch wrestling (Antonio Rocca was my favorite) and horror movies (The Mummy was the scariest.) How could I not love an uncle who lived in the middle of Greenwich Village, who took me to my first Broadway show, who tried to disprove Einstein. How could I not love an uncle who invented a slew of often-useless gadgets, and who chastised major corporations for their lousy ad campaigns — and then offered them new campaigns which were hardly better. How could I not love an uncle who married a wannabe Romanian noble and bought a farm in the middle of the Adirondack mountains because it resembled her native Transylvania. Uncle Joe Rubin died of bowel cancer in 1960 when I was thirteen. I was at an age when I was particularly incurious about life’s complexities, and more than a little spooked by having a close family member wither away in our spare room. Why is it that we neglect to ask the good questions when the opportunities arise? There’s a fine line between genius and (intelligent and lovable) eccentric. My Uncle Joe Rubin died before I could fully appreciate him. Now, going through his papers I find a man of Renaissance-like ambitions. Joe was my mother’s older brother. He was a gentle and generous soul. He saw something in me and took me into New York City to attend the theater, to eat in real restaurants, the ones with tablecloths. I loved it when he would babysit for me – he would defy my parent’s bedtime instructions and together we would stay up late and eat ice cream. He was a Bohemian – after serving in the Navy in World War Two he lived smack in the middle of Greenwich Village – Barrow Street — at the time one of the intellectual hubs of America. He married a head-strong but sentimental Transylvanian, Anisiora Stan, a romance which no doubt caused consternation in both families. I wonder if Joe was disappointed that I wasn’t a child prodigy, that I was just an acned adolescent who didn’t fully appreciate the brave new worlds he was willing to show me. How marvelous, how intriguing are the secrets of relatives now gone. What genes of theirs do I have? What would I say to them if they were around today and we could speak adult-to-adult? More usefully, what should I tell my granddaughter Apsara, now six, in order to give her some insight into a grandfather she might never get to really know? I’ll be around (with memory intact) for another ten or twenty years. Will she be curious? Will she prod me to tell me about my life? Will she care? 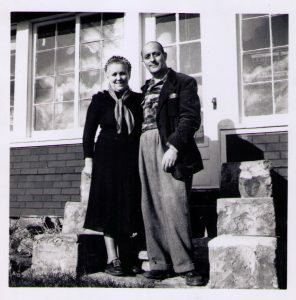 One curious aspect of Uncle Joe’s life was that he and Anisiora bought an isolated farm in the Adirondacks. Joe didn’t drive and it took at least a day by train and bus to travel to the farm from Manhattan. I’m not sure whether they had indoor toilets. I remember Joe as a city boy, and can’t figure out why he would buy such a large — 284 acres (115 hectares) — rustic property. Maybe he had an idealized dream of living a modified-Thoreau existence, if only for a few weeks at a time. (I really like the idea of Joe as an unlikely woodsman.) Or maybe, and this explanation makes more sense, he bought the farm to keep Anisiora happy since the landscape reminded her of her youth in rural Transylvania. I have some photos taken at their seven-room farm; he is wearing a plaid lumberjack shirt and she is wearing a tunic-like dress and styles her hair in a sort of Transylvanian Princess Leia-like coif. I vaguely recall my first visit to the Adirondack house, in the village of Stony Creek, about an hour from Lake George. I was a young child, maybe four or five. It had taken us all day to drive from New Jersey in my father’s Buick. It was an old house, smelling of the forest and dead mice. There was a pond, which I was warned not to go too close to. Then a long drive back to New Jersey. In 2015 my wife and I returned to Uncle Joe’s and Anisoara’s farm. Again, the internet came to my rescue. I not only found the Stony Creek website (town slogan: “The road to a friendly town is never long”), but also the town’s historian, Cindy, who was intrigued by my quest and took a day off work to show us around. The big red house is still there, but was unoccupied when we visited. Cindy said she thought the owner was coming up a few days after we were scheduled to leave, and I left a note for him under the front door explaining my interest, and asking him to please contact me. I have no idea what I expected, maybe an invitation to stop by for coffee next time I’m in the neighborhood. I just wanted a connection with the old place. Never heard from the guy. Joe had made a map of the property showing the house and pond. We looked around, in the rain, but couldn’t find the pond. Then we went back the next day and it was right there, right where it should have been if you turned the map on its side, just a few meters off the driveway. Smaller than I remembered. Still full of frogs and newts and little fish. Everything a boy needs for a summer holiday. I posited my theory to Cindy that they bought the farm because it reminded Anisoara of Transylvania. Cindy added other explanations. The area had several Americana museums and a thriving colony of craftsmen. At that time, many New York intellectuals and artists bought summer places in Stony Creek, and Joe and Anisoara probably joined their friends in the summer exodus, perhaps planning to add a Romanian museum to the town’s attractions. When Joe died my father, who was the executor of his estate, sold the farm. I remember that I bravely protested the sale, arguing that it belonged in the family, that real estate would always increase in value, that we could go there on vacation, that I could have it when I got older. Even though I was still a child (well, a man if you count a Bar Mitzvah as a genuine coming of age ritual), I had a bit of Joe’s wanderlust and desire to live an unordinary life. A classic exercise used by law school professors introducing first year students to the legal profession works like this. While the professor is making her opening remarks a man rushes on stage, wielding a gun. A woman follows him, followed by police, by-standers, innocent children, other bad guys. Shots are fired, people are wounded (spurting blood! ), screams are heard, entreaties are shouted. The action is played by student actors, who, after a minute of mayhem, run out of the classroom. The professor then asks her students “What just happened?” And not one student gets the story right. How many shots? How many people with weapons? What clothes did the shooter wear? What words were spoken? How many injured? “That’s the job of a lawyer,” the teacher says. “Out of confusion you have to put your own spin on reality.” The teacher might have added that “fabricating truth” is also the job of the historian. Anisoara died in 1954 when I was just a kid. I hardly knew her; if I can dredge my memories (and who knows whether they are accurate) Anisoara was a sturdy and strange woman who wore unusual clothes and cooked weird food. No doubt if I had her in my family as an adult I might have been drawn to her as an elegant, eccentric, cosmopolitan artist. A dreamer. My kind of people. But I was six. I was taken to her funeral, which was held in an Eastern Orthodox church in Manhattan. My only vague memory is of getting nauseous from the incense and the over-bearing other-worldly chanting. My mother had to take me out of the church before I vomited on the other mourners. So basically I have no memory of her. What I do have is a written record. Her 1947 autobiography They Crossed Mountains and Oceans. Her 1951 cookbook The Romanian Cookbook. A number of her letters. My Uncle Joe’s eulogy to her, spoken at her funeral. All told, this is more documentation than I have for my own parents. She was from a good, perhaps noble family from Cluj, Transylvania. She was a protégé of Queen Marie of Romania (Queen Victoria’s granddaughter). Queen Marie sent Anisoara to the States to promote Romanian culture, which she did with aplomb. While in the States she became a bit of a favorite of the intellectual/diplomatic communities. (Harold Stassen, governor of Minnesota and nine-time Republican presidential candidate, was an important supporter). She cared about the glory of the Romanian peasant, and liked to wear peasant clothing. She had tea with Eleanor Roosevelt, who later attended one of Anisoara’s art exhibitions. She gave Mrs. Roosevelt a Romanian peasant dress which the First Lady wore to a White House ball. She had a dream to set up a World Park in which the peasants of the world would mingle and show off their diverse handicrafts. Her objective: peace and love, Yoko Ono style. She was a poor writer. She and Joe had no children. As it turns out, the above list is a combination of fact, opinion (trust me, she was a poor writer), and exaggeration. It is mostly implied, filtered, speculated, embellished, questionable truth. She presented alternative facts. Enhanced reality. Thoughtful balderdash. Or, to be less charitable, Anisoara lied. Do you remember what you did, say, ten years ago? How about what you had for lunch yesterday? The memory is a tricky, unreliable resource. Put simply, we all lie. Sometimes intentionally. Sometimes we forget things. Most often because we all filter experiences through our own points of view. The film Rashomon explains how the same event will always be interpreted differently depending on who is telling the story. I went to Transylvania to see if I could learn more. Once again, thank you to Tim Berners-Lee for the internet. I found a site that lists private guides worldwide, and singled out a handful of possible guides in Transylvania who might have been able to help in my quest. I corresponded with them and found one woman, Geta, who seemed to understand and appreciate that I wasn’t a normal tourist. When she picked me up at the airport she said “I can help you, but you really should talk to my brother. I told him about your journey and he has some ideas.” So I had dinner with her and her brother, Iosif (Joseph in Romanian, a happy coincidence), and we agreed that Iosif would take charge of me for a few days. Iosif is a good teacher, which makes him a good student. He’s curious and energetic — one summer he went to Portugal and worked on an isolated farm. He explained that he already knew the languages of the far East of Europe, and thought that as a modern European he should similarly learn the languages of the far West. What makes Iosif such an impressive historian is that he can interpret “factual” statements for historical accuracy as well as for political and social nuance. He even took the time to write a forty-page analysis of Anisoara’s life, filtered through his knowledge of history, politics, and instinct. He noted dozens of anomalies, many dealing with Anisoara’s ancestors’ peasant roots and her political aspirations. Based on details such as the large open fireplace in her parents’ brick home, the fact that they raised chickens and cows, and other details — he concluded that she was one generation removed from a simple rural existence. Iosif said that “she grew up in a rich, powerful, and locally prestigious bourgeois family, while her parents were born in a much poorer, and from an elite’s point of view, both idealized and contemptible rural environment. “Her family were (initially) Greek Catholic, not Orthodox. They were bourgeois peasants who were educated and lived well in turn-of-the-century Cluj, then part of the Austro-Hungarian Empire, and they had well-placed friends. Her family was not noble, but perhaps wanted to be. One might call them arrivistes. Anisoara went to a well-respected school. These are biographical facts. But behind the facts lies a more nuanced story of how she manipulated details to promote a political agenda that glorified the peasant. Anisoara claimed to follow traditions and culture of southern Romania which were different from the behavior she was familiar with in Transylvania, in the north. She mentions that as a child she performed dances which came from the south and would have been unknown to her. In her dust jacket photo she wears a costume she implies is Transylvanian, but which actually comes from southern Romania. But it was similar to the type of dress that Queen Marie wore for political purposes to show solidarity with the peasants and earn their political support, and that’s a key clue to understanding Anisoara’s thinking. Iosif was clear about Peasant Politics: “The early twentieth-century rulers needed the peasants (who formed more than eighty-percent of the population) to obey but at the same time needed those peasants to feel proud enough of themselves in order to obey without having the sentiment that they must obey. Then, just after the end of the First World War, when north-of-the-Carpathians Transylvanians (closer to Budapest and the moral authority of Rome) were uniting with south-of-the-Carpathians Romanians (with affinities to the Ottoman Empire), Anisoara and her family “switched sides” and became ardent nationalists — Anisoara was briefly imprisoned during the early days of this political changeover. And part of that nationalistic discourse, eagerly adopted by Anisoara, was the idealization of the noble, hard-working, artistic Romanian peasant. With such tasty food it is little wonder that the Romanian peasants are so healthy…. Good food puts one in a happy state of mind, the body becomes relaxed and the digestion improved. But equally important is their attitude towards life, a love of the soil and of nature’s work, their songs and dances, their fairy tales related to the children … their famous evenings where the spinning and weaving takes on a festive air, their embroidery and carpet weaving, the making of the peasant costumes, the painting on pottery and even the painstaking carvings on their wooden household utensils. All this gives them no time to feel bored. They are busy and happy. But her Peasant Adoration also had a political purpose. In America, she tried to serve two cultural masters. She wrote her books, no doubt, partly to build up her position in émigré America while not putting her Romanian family in jeopardy back home by the increasingly autocratic governments. (In 1938 Romania started to be governed by a long chain of dictatorships which lasted for fifty-one years). On a deeper level her two books were her calling cards to the world. I get bored reading the great philosophers. For my inner compass I prefer writers who tell a good story. In his 1961 book Strangers in a Strange Land Robert A. Heinlein introduces two concepts which might be relevant to writers and readers of biography. The first is the “Fair Witness,” an individual trained to observe events and repeat exactly what he or she sees and hears, making no extrapolation or assumptions. Her biggest lie, however, revolved around her relationship with Queen Marie of Romania and the reasons she went to America. Throughout the book Anisoara implies that Queen Marie sent her to America in 1922 as an unofficial ambassador to promote Romanian culture and values at a time when the country was striving for international recognition. But that seems to be a big fib, loaded with many unanswered questions. She writes that she met Queen Marie at a public reception in Cluj in 1919 during the royal family’s first visit to Transylvania, following which the Queen invited her for a private chat the same evening. She met Queen Marie a second time in 1922 at a reception at the royal palace in Bucharest, shortly after Anisoara got her first passport. She implies that the Queen gave her letters of introduction. She implies that the Queen appointed her as ambassador. “Grossly fictionalized,” is Iosif’s conclusion. For a start, Anisoara was just 23 when she went to America, accompanied by her younger sister Flora and cousin Letitia. Anisoara had gone to a good school, had worked for high-level government officials, perhaps as a secretary, and had well-placed friends. But, she was 23. She no doubt knew Romanian, Hungarian, French, and probably some German. But there’s no evidence she knew English. She had never been out of her country, in fact she had never been out of Transylvania until she went to Bucharest to get a passport (where she was surprised to learn that the southern Romanians had a baksheesh culture). She had virtually no contact with people outside her immediate circle. Did she have the profile of an ambassador? Certainly not. Did she do a good job anyway? Absolutely. I feel that she was a gutsy, smart, ambitious (and cunning) woman. Look at the discrepancies. She was a travel virgin. She didn’t speak English. She had zero diplomatic experience. If she had been the envoy of Queen Marie she wouldn’t have had to go all the way to Bucharest to get a passport (nor had to negotiate with the corrupt government servants in the passport office). She would have had funds for the sea voyage, instead of asking her mother for the money. She wouldn’t have had to sleep on the couches of working-class Transylvanians in America. She would have had some “official” money, instead of being nearly broke during her early years — in one emotional scene Anisoara writes that she and her sister were staying in a cheap hotel in New York and running out of money. Her sister Flora revealed that she had some extra money (gold coins?) sewn into her dress, to use in an emergency. And, most important, if she had been a true protégé of Queen Marie Anisoara would have had the full support of Romanian diplomats in America. In fact, she was actively opposed by most of the diplomats whom she asked for support. Numerous times in her autobiography she recalls that her valiant energies and events were accomplished in spite of obstructions by Romanian officials. Once a statement is published, it tends to become accepted. I used to write press releases promoting WWF’s conservation efforts; these stories were picked up by press agencies and newspapers worldwide. It was a both scary and empowering knowing that whatever I wrote would become part of the record. Part of the political discourse was fueled by the late nineteenth-century poetry of the fiercely nationalistic Mihai Eminescu, the last great romantic poet in Europe. It was also a time of Romantic dandyism among the elite — duels of honor were not unknown, and men learned, from French sources, thirty ways to shape a moustache. On 1 December 1918, the province of Transylvania united with the Old Kingdom. Queen Marie, who refused an offer of marriage to her cousin, the future King George V of England, was herself a political animal. Queen Marie knew how to play the game of strategic marriages, a dance that has always been an entertaining part of European history. Her daughter Elisabeth became Queen of Greece, her daughter Maria became Queen of Yugoslavia, and her daughter Ileana, whom everyone expected to marry the future king of Bulgaria, surprised observers and married the Archduke of Austria. They were a cosmopolitan lot, comfortable speaking English, German, Romanian, and French. One can only imagine the tales they told (in what language, one wonders?) around the dinner table. But no doubt part of her drive was to improve the image and credibility in America of Romania. In the real world each of us falsifies, exaggerates, obfuscates. And even if we say or do something we rarely fully understand the emotions or logic behind the act. So the picture of Anisoara as a well-intentioned, idealistic, partly spoiled, partly naïve young woman might be incomplete — she might have been much more of a political animal than she admits. At least that’s my understanding of the truth. I’ve written it and signed my name to it. Do you believe me? Anisoara sailed to America laden with trunks containing peasant dresses, handicrafts, carvings, paintings, embroidery and carpets, table cloths and head scarves, icons and jewelry. She was going to be a cultural ambassador and these objects were to be her calling card. (They likely were also her dowry.) With these items, and other costumes and crafts she collected from Transylvanian emigres in the States, Anisoara staged exhibitions throughout the country, culminating in a large and successful show at the Shoreham Hotel in Washington, D.C. When Anisoara died Joe donated her folk art collection to St. Mary’s cathedral in Cleveland, Ohio, where it still is displayed. I have one physical memento of her, a hand-carved wooden box, decorated in an exuberant style. I have just one physical object that belonged to Joe — his slide rule, constructed of wood and Bakelite and made by “Keuffel & Esser Co. New York” with a patent notice for “June 5, 1909.” It’s in a battered brown leather case on which he had etched in pen a monogram with his initials. (Yes, I know how to use it for simple multiplication and division.) Similar pieces can be bought on eBay for around $20. And I have numerous photos. In one picture he appears in military uniform, wearing a trooper style wide-brimmed hat, standing stiffly at attention with his rifle by his side. In another he stands on the steps of what could be a government building or a school. He reminds me of a between-the-wars spy, or lawyer, or businessman. Hard to tell. One of the challenges of writing a short biographic sketch like this is what to include, what to leave out. In general, less is more. I don’t expect many people to read this, after all, this is my family and while Joe and Anisoara were interesting people they didn’t change the world, nor did they live extraordinary lives. How much detail does the reader require? If you’re writing your autobiography how many anecdotes is enough? How many love affairs, how many job changes, how much detail does the family need about illness and hard financial times and pet cats and car accidents and growing roses. Every Romeo needs a Juliet. Every artist needs a muse. Every hero in an adventure movie relies on a sidekick. So it was with Joe and Anisoara. He needed her; she needed him. We all live in our stories, and the more we repeat them the harder it is to break out of the steep gulch they put us in. The story might be dark and paralyzing — the woman who was abused as a child and has gone through adult life either as an angry victim or as a helpless child. The story might be less debilitating but still damaging — the woman who can’t hold a job because “all my bosses are idiots,” or the man who also can’t keep a job because “I’m not good enough.” Golfers have it too — put a pond between their ball and the target and often they will fail to hit a clean strike and plop the ball into the water, finding a sick pleasure in being wrong. We are too clever, we resist the facts staring us in the face — the abused child had no choice — she did not cause the action — and instead of facing reality we make up tales which, often in a detrimental way, satisfy us. God brought me a prince charming, a young man who smiled so devilishly not only with his whole face but his eyes as well and who had what we call vino incoace — a ‘come here’ look. Was it love at first sight? Yes, yes, it was. We met [perhaps at Joe’s sister Jeanne’s home in Bedford Hills, New York] on Decoration Day, May 30, and spoke only a few words. I saw her for an instant, and in that brief moment knew no other girl could ever exist for me. She had outer beauty, of course, but it was her inner beauty that captivated me. In our first conversation I realized I was speaking to one of the few chosen people of the earth, and with the years this feeling has grown and grown. Anisoara continued her retelling of Joe’s courtship. Before he said goodbye he asked for my name and address. What for? I do not see any reason for it. I am leaving he United States on my return to the city. I am glad I met you, but no name, no address. Goodbye. I am at my sister’s [Jeanne’s] country place in Bedford Hills. Found this in the garden and as I thought of you I am sending it along. Won’t you please write just a few words? To Anna, the most beautiful girl I ever met. From Joe, June 2, 1930. I feel so funny inside of me about this fine American with his so humane eyes and that characteristic smile of his, which causes little wrinkles at the corners… and his so handsome dark oval face. He wore his clothes nonchalantly, in a devil may care way. And what might have sealed the deal was the Thomas Hardy book, which she loved. But Anisoara had a history of intriguing men, almost as if she was a fire drawing moths to the light. She wasn’t a seductress in the modern sense, but she had an energy that some men appreciated. She recalled that she had almost been engaged to a millionaire, a half-American, half-English man, living in South America who wrote to her parents asking for her hand (yes, it was a different world). Anisoara’s mother wrote to her daughter that although he was no doubt rich and good-looking “You don’t love that man, you are just attracted to him. Don’t do it,” the mother said. And Anisoara didn’t. And so it went. Joe persisted, Anisoara resisted. He called, sent her letters, she refused all contact. A lesser man would have given up. Finally she agreed to have dinner with him at Enrico & Paglieri, a noted (and now defunct) Italian restaurant in the Village, with her sister Flora as chaperone. The following morning after their dinner Joe visited her again and asked her to marry him. She agreed. They were married on Saturday, September 13, 1930, the day she had earlier told him she was leaving. Anisoara then went to Romania for a year. On her return Joe said he would support her work to promote Romanian folk art. He agreed she could use her maiden name. Yet in her 1936 U.S. passport (“Not valid for travel to Spain”) and in her 1948 U.S. passport (“Invalid for Germany, Austria, Japan, Korea and Yugoslavia”) she used the name Anna Rubin. Do you know the precise details of your mother’s life? And do you understand, deep in your being, what made your father the person he is? One project occupied Anisoara more than any other. I went through her papers and found notes and proposals for her grand project, which she alternatively called an outdoor museum of villages of all peoples, a World Village of Peasant Art, an outdoor Ethnographic Museum of Peasant Art and (hopefully, if she could gain UN recognition), the United Nations Ethnographic Museum. She wrote countless letters to ambassadors and high-ranking officials requesting support, and Joe dutifully would take them to the post office, sometimes at two in the morning. One of her patrons, Harold Stassen, the governor of Minnesota, proposed that his state’s Whitewater State Park would have been an appropriate home for the venture. A drawing by Martin Lowenfish, an architect she hired for her ambitious venture, shows a Dutch village with a windmill, a Chinese community with a pagoda, a Mexican village with a Mayan ziggurat, a Turkish settlement with a minaret. Anisoara said the museum “would symbolize the peaceful pursuits and neighborliness of all nations. Each village would be peopled by first- or second-generation Americans, familiar with old country crafts. We have a desire to know the “facts” of someone’s life. In many cases these are relatively easy to elucidate. Dates of birth, marriage, employment. Jobs held. For some people this is sufficient data to comprise an autobiography. Different people have different opinions about everything. People then and now seem to arrive at conclusions in one of two ways. They might have an opinion and then seek evidence to support their views (for instance, people who espouse creationism and use Biblical references and circular logic as their proof). Or they might examine data and come to a conclusion based on statistics, logical arguments, and replicable experiments (for example, people who believe in climate change because the science is, in their minds, sufficiently convincing). But usually we make our decisions based on a combination of what we want to be true, combined with a dose of hard evidence. The balance between the two extremes varies depending on our personalities, education level, and social environment. Consider how we judge a politician running for elected office. Do we believe the countless stories circulating about her? What news stories do we believe? What rumors do we believe? For example, do we believe, in our hearts, that President Barack Obama was born in Kenya in spite of hard evidence he was born in Hawaii? Do we believe that U.S. astronauts really landed on the moon or are we convinced the 1969 moon landing was a hoax produced in a top-secret TV studio in Nevada? What is the tipping point that causes our support (or disapproval) to flip? Joe wanted me to do well in school. At some stage I had to write a series of reports on various countries (using information mostly cribbed from the Encyclopedia Britannica). Joe contacted one of his artist friends who sent me hand-drawn title pages with the country names Tibet, Japan, and India written to resemble the distinctive calligraphy of each country. I didn’t realize it then, but those reports, and his support, also signaled my fascination with Asia at a time when Asia to me was just a vague, distant concept. Willard Van Orman Quine described a “web of belief,” the idea that we accept or reject a belief on the basis of how well it fits into our self-created web. Beliefs at the center are entrenched, because changing them would require rebuilding large parts of the web, while those on the periphery can be easily altered or ignored. We do not hold beliefs one at a time; rather, we assess them in a group, because they are logically connected. If we let one go, we have to let others go as well. Joe had three patents (that I’m aware of). In 1941 he came up with a “Traffic control device” which featured ”a visual representation of the time a light will remain on, so that one can tell at a glance whether he can safely cross. It featured a descending light so a pedestrian could judge how much time remained before the green light changed to red. It’s sensible, and this concept, if not the design, is used today worldwide by pedestrian lights which count down the seconds remaining to the change of light. And in 1944 Joe invented a “Self-supporting luminaire globe,” a sensible improvement to make light fixtures easier to use. In his correspondence I found notes from 1941 (but no patent) for a shark repellent and a 1931 paper stating that “cholesterol starvation” was the cause of loss of hair, a subject of particular interest to Joe, who was bald. Journalist Oliver Burkeman describes the “quietly unsettling” concept of “verbal overshadowing,” as “memory that’s liable to make you wonder if anything you believe about your life is really true. The finding is this: putting your experiences into words — talking about them with others or writing them down — makes you less likely to recall them accurately. If you were to witness a mugging, say, then scribble a record of what you’d seen, you’d be more prone to misremember than if you’d written nothing.” By retelling experiences we consolidate our error-riddled version of the truth. Joe was a polymath and the world of advertising fascinated him. I found an undated, hand-written pamphlet he wrote promoting a “completely new advertising technique” called Copy Analysis which would evaluate advertising copy. There is no explanation what the “technique” consists of. In 1953 he wrote an eight-page analysis of an Amoco Tire Ad, telling the company how they could improve on their poster, “Sure Footed Safety,” which showed a cat walking on a fence. Slipperiness, the only true measure of a lubricating oil’s worth. It will keep your motor young. And, intriguingly, I have a 1939 letter from Goldsmith, Jackson & Brock law offices acknowledging that they would agree to represent his complaint against the R.J. Reynolds Tobacco Company. I have no idea what that was about. We are particularly loathe to reconsider “certainties” that we hold at the center of our self-created moral structure. Changing these core “web beliefs” would require a major psychological rebuilding project, something we are loathe to do and the reason why seemingly reasonable people are sometimes totally irrational. There is a “confirmation bias” at work by which people easily accept information that supports their beliefs while rejecting information that contracts them. And I have Joe’s manuscripts and notes for his papers debunking Einstein. When I first thumbed through them I thought “this man is a genius.” Then I reconsidered, thinking “This man writes with the manic energy of a serial killer from the movies.” Typescripts. Dozens of notes scribbled on scraps of paper. Long treatises written on yellow legal pads with complex equations and diagrams. Strong red gashes where he excised text. He was in over his head with the physics, and his correspondence file contains polite letters from leading journals and scientists telling him to stick to chemical engineering. His notes on items such as “Calculations on Size and Collapsing Atoms” tell me that: “Vol of proton = 1/25 x 10 12 = 1/91125 x 10 45” His ideas are written on scraps of colored paper. Maybe this is the work of a genius, similar to a lost folio for an undiscovered Shakespeare play, or sketches for Beethoven’s never-achieved Tenth Symphony. Or maybe a coded map that will lead to Atlantis or the Holy Grail. What struck me is not that he’s got his physics wrong, but the civility of the people he dealt with. The letters on file include numerous letters from journal editors who politely thanked him for his contribution, politely disagreed with him, and took the time to offer several pages of notes. My father had the Male Disease — he rarely talked about himself. I have only a vague idea of what he did in the war, what his experiences were as a child, his relationship with his own parents. He’s long gone, so all I know are whispers of understanding that have simmered in my brain. What obligation do we have to record the life stories of our family and friends? What obligation do we have to record our own stories? And what obligation do we have to seek the truth, with its sometimes crusty edges and ugly smudges? The director of the observatory (which was the High Altitude Observatory of the University of Colorado, with nothing to do with Harvard), sent him a detailed letter apologizing for the delay in responding and giving detailed answers to his questions. A kinder era in our society. I wonder. When I’m dead will anyone bother to sift through the flotsam of my life and try to create a more nuanced narrative that exposes my foibles to the glare of the dissecting table? It wouldn’t be too hard. I’ve left thousands of pages of published articles and books, nearly all somewhat autobiographical. And in the bowels of my cellar the adventurous might find letters, diaries, and photos that expose even more of my soul. Should I care if the investigator discovers rough edges? But perhaps it would be best to not delve too deeply, to leave things in that happy haze of memory and to simply recall my life in whatever manner the detective finds reasonably accurate and comfortably rewarding. Two very different people — the brainy, struggling and good-hearted New York Jewish nerd and the complex exotic Eastern European Orthodox woman with a political agenda and a sentimental heart. Did they love each other? Almost certainly. Did each make the other partner better? Absolutely. Will we ever know what their relationship was really like and what emotions they felt? Of course not. I’m the last surviving relative with even a smattering of interest in Uncle Joe. Anisoara’s relatives have disappeared in the forgotten file cabinets of Romanian history. They left no children, only some documents. But through their writings we can imagine what their lives were like, and perhaps that’s good enough. When I want to channel them I imagine Antonio Rocca delivering a flying kick on the lumbering Mummy while eating mămăligă cu brânză și smântână in a pavilion in the World Village of Peasant Art, just as my parents drive into the driveway, looking at their watches and happily grumbling “Joe is going to spoil that boy.” That’s enough. Paul Sochaczewski’s numerous books are available on Amazon; most tell tales of true and curious personal travel. This article uses many of the techniques he teaches in his writing workshop Share Your Journey, and in the writing handbook of the same name. Paul can be reached through his website www.sochaczewski.com which contains biographical notes that some people believe.